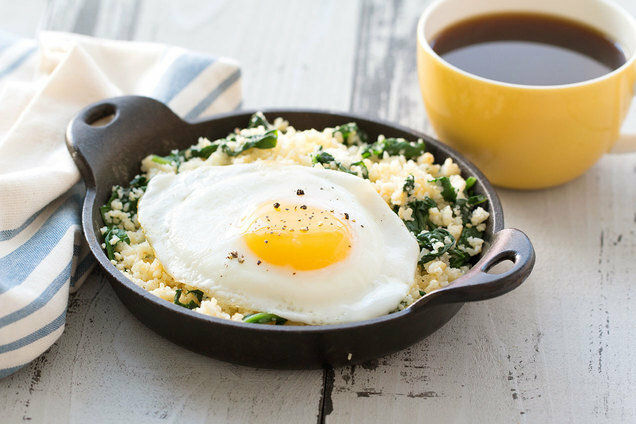 There's a new breakfast sweeping Hungryland -- it's got savory grits, eggs, and... cauliflower? Yes, cauliflower! One bite of this, and you'll be cauliflower crazy like the rest of us. Pulse cauliflower in a blender until reduced to rice-sized pieces. Transfer to a medium microwave-safe bowl. Add grits, a dash of salt, and 1/3 cup water. Mix well. Cover and microwave for 2 minutes, or until thickened. Stir well, and let cool for 5 minutes. Add egg whites and cheese, and mix thoroughly. Bring a large skillet sprayed with nonstick spray to medium-high heat. Cook and crumble cauliflower mixture until fully cooked and lightly browned, about 6 minutes. Add spinach, onion, and remaining dash of salt. Cook and stir until spinach has wilted, about 1 minute. Divide mixture between 2 plates or bowls, and cover to keep warm. Top each portion of the hash with an egg. Hungry for More Healthy Breakfast Recipes? November 12th (today) is Chicken Soup for the Soul Day. If it's been too long since you made our perfect Hungry Chick Chunky Soup, now is the time. Know a pal who'd go nuts for this breakfast? Click "Send to a Friend" stat!